This is an overview of what is new in FirstClass 8.3. For more detail about the information you see here, see the FirstClass 8.3 online help. All Desktops, a new Standard Desktop template in the administrator's Groups folder, precedes the All Users group and is used to set system-wide Desktop view properties. These settings override users' personal view properties on first login with an 8.3 client. In the past, there was no way to localize standard Desktop objects. No matter what language your system used, the Mailbox was always called the Mailbox. With this release and the new modeling capabilities, you can freely localize standard objects and they will continue to work. When you run the FirstClass 8.3 upgrade, it will ensure that all admin Desktop items exist and are named appropriately, rearrange the Desktop layout, add a container called FC Control, which will be used for future FirstClass upgrades, and add a container called Object Templates, which contains all the templates used for standard FirstClass applications. No existing objects or items will be deleted from the admin Desktop. FirstClass now has the ability to automatically prompt users to upgrade their FirstClass client when the administrator makes a new version available. Administrators can configure a range of possible upgrade strategies, including forcing users to upgrade or allowing them to defer updates for later installation. The automatic upgrade process has been carefully designed such that the new versions are delivered from each server, instead of from our server, so that individual administrators may choose an appropriate time to deliver new software versions. Client updates will be sent to the FC Control container, and the administrator chooses when to distribute the new software. Once approved for distribution, the file goes to the All Desktops container template Rules/resources folder and users are prompted to upgrade on login. The administrator can retrieve a user's password in plain text format using the FirstClass scripting GET command. Adding +M option to the command will retrieve the MD5 hash of the password. Users can now choose their outbound alias by clicking the outbound alias button beside their name in the From field of a message form. The chosen alias will be used as the From name when the message is transmitted via SMTP. The aliases are pulled from the User Info form. If a message is addressed to an internet mail address that exists on your FirstClass site, it is now routed directly by the server instead of through internet mail using Internet Services. This spares unneeded load on Internet Services. For example, Roy Allen is a Husky Planes employee. His internet email address is roy@huskyplanes.com. Stephanie Garbo is a new Husky Planes employee who is unfamiliar with FirstClass. She addresses mail to Roy as roy@huskyplanes.com. The server recognizes that the message is for Roy Allen and instead of routing it over the Internet, automatically sends it locally to Roy Allen in the Husky Planes Directory. These are a variant of remote names, and can be added manually or by a sync program through Directory Services. The administrator adds the off-site user as a remote user whose mail is routed via the Internet gateway, instead of a server-to-server gateway. The remote user is then addressable by users from the FirstClass Directory. This means that if your company uses FirstClass, but your parent company, or another division uses a different mail service, the names of the employees on the other mail service can be added as remote names to the Directory. A FirstClass user addresses mail to the user on the other mail service, simply by typing the name (or part of the name if multimatching is enabled), not the whole email address, and FirstClass automatically routes the message to the other messaging service's domain over the internet. Events created in group calendars now appear "from" the calendar. When a new folder is created, the expiry is set to "default", which translates to "never. Items moved to folders will never expire unless an individual item's expiry limit is changed. When a new folder is created, the view properties are inherited from the parent container, but the group membership is not inherited. The owner of the conference now appears as the first name in the subscription list. Also, the subscription list is now presence sensitive, so logged in users will appear in bold. 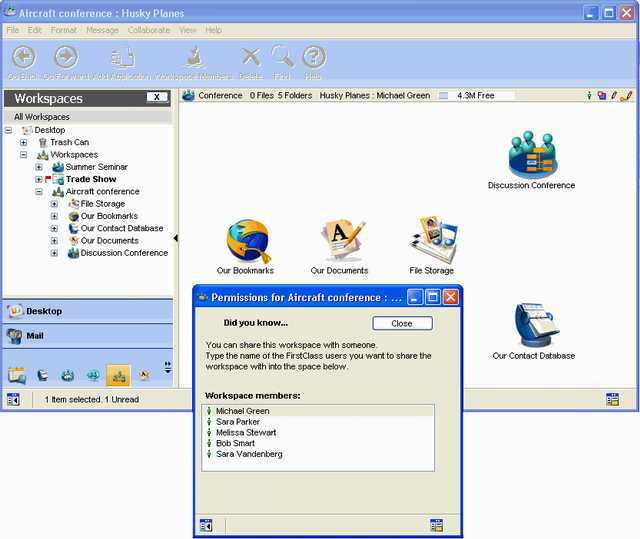 When a user is subscribed to a conference, the conference appears on the user's Desktop in the same location as the original. Custom columns can now be added to contact databases and calendars. New conferences can be created with the custom column "Preview" automatically enabled. This feature is designed for web publishing support on sites that support more than one domain name, especially multi-tenant environments. Set the group domain name to be used as the Internet email alias and web page domain on the Group Privileges form. If there is no group setting, the domain name is obtained from a web service which serves the user (found on the Web tab of the Basic Internet Setup form). Uploaded files now retain the OS creation/last modified date and time, except when uploading resources to a Rules/Resources folder or the Resource Registry. Resources display the uploaded date. This is a container template used to set default permissions for all user Mailboxes. This is a container template used to set default permissions for all user Bookmarks folders. This is a calendar group used to set default permissions for all user and group calendars. This is a Desktop template used to set default view properties for all user Desktops. See Desktop modeling. This is a container template used to set default permissions for all user blogs. This is a container template used to serve out the default toolbar for clustered services. This is a container template used to set default permissions for all the administrator's help conference. This is a container template used to set default permissions for end user online help conferences. If the server has not been started within a 24 hour period since the last shutdown, the server will start in "protected mode". In protected mode, audit will still perform system repairs, but will not remove any expired or deleted items. The administrator must force a full audit to return to normal functioning. When users' items expire or are deleted, they will appear in the Trash Can for the length of time specified by the administrator on the Limits tab of the Group Privileges form. Users can undelete items from the Trash Can, or can drag items from the Trash Can to other folders on their Desktops, thereby undeleting the items. This record is created when a user autoregisters and Session login/logout is selected on the Statistics Control form. This record is created when a user enters an incorrect password when logging in and Session login/logout is selected on the Statistics Control form. This record is created when a user initiates or joins a private instant messaging session and Private chatting is selected on the Statistics Control form. This record is created when a user enters a chat room and Public chatting is selected on the Statistics Control form. This record is created when a new folder is created and Conf. create/delete is selected on the Statistics Control form. This record is created when a folder is deleted and Conf. create/delete is selected on the Statistics Control form. This record is created when a new conference is created and Conf. create/delete is selected on the Statistics Control form. This record is created when a conference is deleted and Conf. create/delete is selected on the Statistics Control form. This record is created when a conference's permissions form is edited and Edit conf. permissions is selected on the Statistics Control form. This record is created when Internet mail marked as spam is received. The new volume.cfg file enables you to make network drives available to Windows servers. There is a new field called "Deleted mail removal". Use this to specify the number of days deleted items will remain in users' Trash Cans before they are physically removed. There is a new field called "Default web domain". Use this to specify a separate web domain for an OU. This field has been removed. All users can now use the search feature. This privilege is now split into Conference mail and Share conferences. Conference mail allows users to send mail to conferences for which they have the appropriate permissions. Users without this privilege can still read messages in any conferences for which they have the appropriate permissions. Share conferences allows users to create new conferences on their Desktops, or in any container in which they have permission to do so. This privilege works with the Create conferences permission; users can only create subconferences in conferences for which they have this permission. Users without the calendar privilege still have a calendar on their Desktops and can use the calendar for personal scheduling, but cannot invite other users to events. Users without the contacts privilege still have a contacts folder on their Desktops where they can store personal contact information. However, they cannot address mail to these contacts. This is a new privilege, which gives users permission to create personal workgroups within shared workspaces. Users without the share workspaces privilege still have a workspaces folder on their Desktops, in which they can organize personal projects. However, they cannot create workgroups to share their workspaces with other project members. Remote internet aliases are now supported in the Directory. See Remote internet aliases. Licenses applied after 8.3 can be applied online without having to run FirstClass Tools. The form has been restructured. Batch folder processes FirstClass scripting files in the FCNS/Server/Batch folder. It is no longer necessary to restart the server to initiate processing. Reset Services resets all service gateways, breaking the connection of any user logged in via a service. Reset modems resets all server modems, breaking the connection of any user logged in over a modem. When uploading/attaching files, if no MIMETypes data is available, Internet Services now maps the filename extension to the equivalent Macintosh file type/file creator values based on a FILETYPES record. FILETYPES is a new, built-in table of well-known extensions, file type and creator information, and icon ids. The FILETYPES table contains the default icon id to use for many file extensions. You can now override this default by adding a new icon id to the end of the associated line in the MIME Types document. This is an optional field that specifies which icon id to associate with this file type if you wish to override the default icon id. which requests that the recipient's email program send (with the user's consent) a return receipt indicating that the user has read the message. When a message has arrived via Transport Layer Security (TLS), Internet Services adds a comment showing some information about the connection. If there is only one recipient for the message, Internet Services adds a For line with the address as specified in the RCPT TO command. The Java folder is now called the Plugins folder. This folder stores the plugin templates for Blog, Podcast, Bookmarks, Loft, Block, and RSS. See New in FirstClass Web Client for information about the new applications listed above. New variables have been added to the headermatch document to support the new plugins: SIDELINK, SIDELINKALIGN, SIDELINKPAGESIZE. Many updates have been made to the IS Script Library, specifically the X-FC tags. These changes are for advanced Internet Services users, and will be made available in the FirstClass WebMasters conference on FCOL. The Internet Monitor now tracks SURBL statistics. This is a new button that takes the current IP address listed in the Suspected abuse of denial of service area and shows the corresponding domain name, if it has one. A checkbox has been added to allow the administrator to activate TLS checking. Userid and Password fields have been added to this form, allowing Internet Services to send mail if the route through SMTP server requires Internet Services to authenticate. The new FirstClass Desktop features instant access to tree view, navigation bar with application launch buttons, and the reading pane. This new interface highlights the FirstClass applications and will help improve ease of use. The standard applications on All Desktops are: Mailbox; Calendar; Contacts; Documents; File Storage; Trash Can; Conferences; Workspaces; Instant Messaging; Web Publishing; Bookmarks; Help. Both the new and improved applications are described below. You can now resize icons easily with an Icon size control located on the Icons tab of the View Properties form. You can now make text that doesn't fit on one row wrap to subsequent lines instead of being cut off, by selecting "Variable height rows" on the Display tab of the View Properties form. Go Back and Go Forward buttons let you move among the objects you have previously opened, just as if you were using a web browser. A workspace is a shared area where users in a workgroup have access to the same resources. A typical use for a workspace would be to provide a common area for everyone who is assigned to the same project. It is a simplified way to create shared areas, in that you don't have to concern yourself with permissions; only those users added to your workspace can access it. Workspaces can be created by your administrator, or by yourself or other users. All workspaces that you have created are stored by default in the Workspaces container on your Desktop. You can drag a workspace out of this container if you want to store it someplace else. If this feature is not enabled, you can still use this area to create and organize personal projects, but you will not have the ability to add any workspace members. The File Storage folder on your Desktop is a place for you to store uploaded files for your personal use. You can store files in various media, such as text, pictures, sound files, and movies. The File Storage folder provides toolbar buttons for all the tasks you commonly do with files, such as uploading and downloading them, previewing them, and sending them to other users. You can also create subfolders for organizing your files, and move files into these folders. All users have access to this feature. You can store any personal files in this folder. FirstClass renders the contents of the Web Publishing container directly to the web. You can easily create a personal web site including regular web pages, blogs, and even podcasts in this container, and easily view the site as it is developed. If this feature is not enabled, you can still create internal home pages, which can only be seen by those people who can see your name in the Directory. The Web Publishing container holds podcasts you create. A podcast is a collection of audio or video tracks or clips (episodes). You first create a podcast to hold your episodes, then you create your episodes inside it. The Web Publishing container also holds your blogs. A blog is an online diary to which you add dated entries. You first create a blog to hold your blog entries, then you create blog entries inside it. The Documents folder on your Desktop provides an environment that is optimized for documents. You can manage all your documents from one location. You can create subfolders for organizing your documents, and move documents into these folders. All users have access to this feature. You can store any personal FirstClass documents in this folder. Your administrator can use the Conferences container to make selected conferences available to all users in one storage place. You can also click the Conferences application button to narrow the tree view to objects that are conferences. You can now add bookmarks to the Bookmark folder directly from your web browser. Objects in folders no longer expire by default. When your items expire or are deleted, they will appear in the Trash Can for the length of time specified by the administrator. You can undelete items from the Trash Can, or can drag items from the Trash Can to other folders on your Desktop, thereby undeleting the item. You can now choose your outbound alias when you create a message by clicking the outbound alias button beside your name in the From field. FirstClass now substitutes local FirstClass addresses for Internet addresses where possible. You can now choose to display either a unified Mailbox or a separate Inbox/Outbox in the "Mailbox style" field of your Preferences form. Choosing a separate Inbox/Outbox displays the contents of your Mailbox in four separate containers: Inbox, Drafts, Junk Mail, and Sent Items. You can now choose a FirstClass or Outlook style for your standard message form by specifying the "New mail form" in Preferences. Commonly used fields are now on the first Event form tab. Urgent events and tasks are now listed before nonurgent ones. Saturday and Sunday are now split into two separate columns in the month view, but you have the option of collapsing them into one column in your Calendar Preferences. Also, the weekend days are now determined by your work week start day. For example, if your work week starts on Wednesday, your weekend days are Monday and Tuesday. Dragging a message or document to a calendar creates an event, while dragging it to the Today list creates a task. You can also drag a vCalendar file to a calendar, which creates an event. Incoming events now take on your own reminder preference. FirstClass Personal now does a full synchronization of all objects in your personal calendar, as well as your Contacts, Bookmarks, and Documents folders. You can now choose from a list of templates when you create new objects. When you create a new object (for example, calendar, container, web page, document, presentation), you are prompted to choose from a list of templates. The selection list depends on the object you are creating. This assigns properties or permissions to the object so you don't have to configure it each time. FirstClass will automatically notify you upon login if there is a new client ready to be downloaded. Simply choose to download it, run the installer, and FirstClass will install it to your hard drive and prompt you to log in using the new client. References to Mac now apply strictly to Mac OS X. The updated web interface will help improve ease of use. You can toggle the tree view and the reading pane, providing the ability to instantly change your view with the click of a button. You can now resize icons easily with an Icon Size control located on the View Properties form. You can now make text that doesn't fit on one row wrap to subsequent lines instead of being cut off, by selecting "Variable height rows" on the View Properties form. Workspaces can be created by your administrator, or by yourself or other users. All workspaces that you have created are stored by default in the Workspaces container on your Desktop. You can move a workspace out of this container if you want to store it someplace else. The File Storage folder on your Desktop is a place for you to store uploaded files for your personal use. You can store files in various media, such as text, pictures, sound files, and movies. You can also create subfolders for organizing your files, and move files into these folders. You can now choose from a list of templates when you create new objects. When you create a new object (for example, calendar, container, web page, document), you are prompted to choose from a list of templates. The selection list depends on the object you are creating. This assigns properties or permissions to the object so you don't have to configure it each time. When your items expire or are deleted, they will appear in the Trash Can for the length of time specified by the administrator. You can undelete items from the Trash Can, or can move items from the Trash Can to other folders on your Desktop, thereby undeleting the item. When you create a message, you can now choose your outbound alias from the dropdown list beside your name in the From field. Commonly used fields are now in the first Event form section. Saturday and Sunday are now split into two separate columns in the month view. You can now change the font family, size, and color in which calendar text is displayed in all views. FirstClass now has a rich text editor that lets you format content and embed objects, including links, in content.   update any applications if data sources are hardcoded into the application. The FCPOFolder command now returns the directory from which the FCAS.exe file was launched, so that applications using this can continue to function without modification. This may change depending on where you installed the FCAS executable file. The Application Monitor lets you perform a variety of tasks either locally or remotely. FCAS has multiple logging levels that can be turned on and off, similar to the server and Internet Services, configured from the FCAS console. The new ServerFile attributes and ServerFile methods work exactly the same as the existing FILE objects, except they are used on server-based files instead of local files. By default, FCAS offers 250 free concurrent applications. Above this number, you will require a license. FCAS is a protocol module that connects directly to the FirstClass server over a gateway and can access server files. If a settings file was updated by a more recent version of FirstClass Designer, FirstClass Designer will only open the file in read-only mode.   drag PNG files to any other category to add them as icons or pictures, depending on their file names (numeric file names become icons). A new slider control field lets users slide a control on a slider bar, or click the bar, to change predetermined values. A new open document button opens a form with a body that can contain formatted text. The Save as HTML command has been removed. References to Mac now apply strictly to Mac OS X. Also, you can now display text and icons or text only on the Mac toolbar. You can set up multiple instances of FCDS for your server, each one servicing different sets of users as defined by a cluster-defining OU. You can now specify that FCDS handle only certain OUs.   scanning replicators (Active Directory and FCDS' Generic LDAP Replicator). You can now specify the object class for contact entries. You can now uniquely identify entries on the external LDAP server without using the DN. You can now add trace information to logs for debugging purposes. Authentication methods are now restricted to FirstClass secure and remote. You can also specify the external LDAP server's root DN, when it differs from the FirstClass Directory root DN for purposes of authenticating on the external LDAP server. You can now analyze web statistics, voice statistics, and server performance events. You can save user statistics analyses in FirstClass Log Analyzer format (.FCL). You can view these FCL files again in the Log Analyzer and compare data from two files. Log Analyzer lets you quickly search for specific user statistics entries without having to process an entire file. An updated user interface makes Log Analyzer easier to use. For more information on anything in this article, see the FirstClass 8.3 online help. Copyright 2006 by Open Text Corporation.